That question is infinitely easier to answer when you keep a “signature recipe cookbook” on hand. Follow these quick tips from At Home with Madame Chic to create your own. Combine all of your favorite recipes in a small binder and keep this as your signature recipe cookbook. 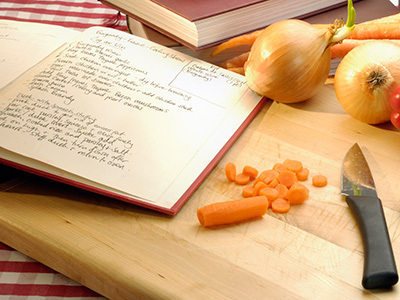 Cut out recipes from magazines, print from the Internet, or photocopy them from your favorite cookbooks. This way you will have all of your favorites in one handy place. Whenever you are menu planning and feel at a loss for what to prepare, you will be inspired when you open this homemade book full of your family’s favorite recipes. Some of the signature dishes included in my repertoire are: shepherd’s pie, leek and cheese pie, spinach and goat cheese tart, honey soy chicken, chicken tacos, maple-glazed salmon, leek and potato soup, lentils and rice, beef stew with dumplings, slow-cooker pot roast with potatoes and carrots, apple pie, berry crumble, and flourless chocolate cake. Jennifer L. Scott is the writer and editor of The Daily Connoisseur (DailyConnoisseur.com). She lives in Santa Monica, California with her eccentric husband, adorable daughters, and distinguished Chihuahua. 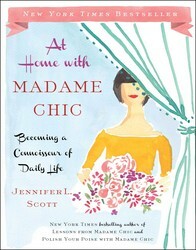 Lessons from Madame Chic: 20 Stylish Secrets I Learned While Living in Paris is her first book. To learn more, visit JenniferLScott.com.